I got a late start in competitive swimming – I was 32 when I participated in my first USMS Nationals in 1978, and actually back then it was known as USA/AAU Masters Swimming. 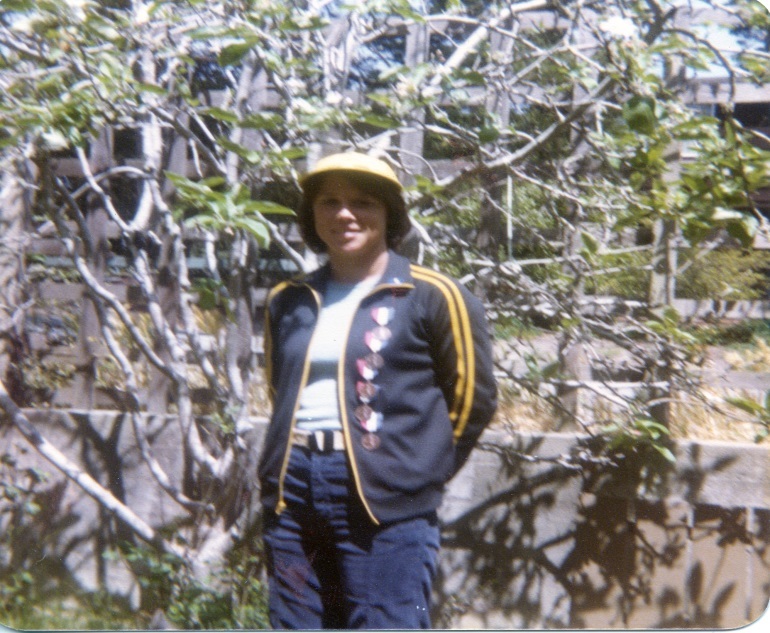 I learned how to swim from my father, who threw me into a pool at a young age (maybe 4 or 5) with the command “Kick and move your arms around!” Other than that, I had no formal stroke training until I took a “Swim for Fitness” class at Monterey Peninsula College (MPC) in California, in 1976. I loved that class, and just getting in the water, so much that I took that class 2 or 3 semesters in a row. Then one day the MPC Swim Coach, Ted Trendt, invited me to start working out in the mornings with the MPC Swim Team; he said I could work out with them even though I wasn’t a full-time student. That introduced me to what a real swim workout feels like, and the results that can be achieved with regular training and proper attention to swim stroke techniques. 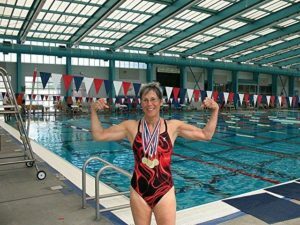 I started participating in swim meets in the California Central Coast area, usually placing in the Top Ten for my age group, and getting to know some of the swimmers in the area, like Nancy Ridout and others. At this time I swam unattached, as there was yet no Masters team in my immediate area to join. With the encouragement of my MPC Swim Team coach and buddies, I worked up enough courage to take myself to Nationals in San Antonio, 1978. What a fun experience! I placed in the Top Ten in 5 of my events! I was absolutely thrilled, and also absolutely hooked on swimming from then on. At that point in my life (1978) I was married, had two young children, and had just started working outside the home. I hired on with Pacific Bell as a cable splicer. My career with them continued on until 1994, where I held various positions: cable splicer, Outside Plant Engineer, and Long Range Planning Engineer. From there I continued on in the cellular field as a Project Manager, working in several international and domestic projects until 2002. In 2002 I changed direction entirely, went to school to learn how to be a massage therapist, and then operated my own practice from 2002 – 2010. I have been retired since then. So, my competitive swimming stopped after that first Nationals in 1978, but I did not stop swimming. I continued to work out in a pool on my own from 1978 – 2007. For approximately 29 years I religiously did my own workouts 3 times a week, in whatever pool I could find, no matter if it was in the good ol’ USA, Seoul, South Korea; Budapest, Hungary, or wherever! My life was busy with career, husband, and raising our two kids, and I had no time for swim meets, but I sure loved getting in the pool to workout 3 times a week. In 2007 we were living in Henderson, Nevada, and I joined the Las Vegas Masters, coached by Vic Hecker. I feel so fortunate to have benefitted from his expert coaching. 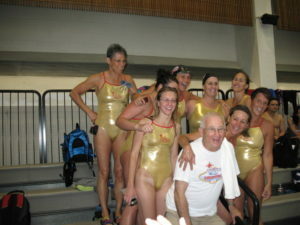 Vic is a dynamic coach, always positive and upbeat, and motivates his swimmers in a very positive way. Under his coaching I started competing again, after such a long break. As a member of Las Vegas Masters, I competed in the 2008 Nationals in Austin, TX, and the 2009 Nationals in Fresno, CA. I placed in the Top Ten in several events at these meets also, which served to build my self-confidence and self-esteem, as swimming has done all my life. Another fun event I entered was the Nevada Senior Olympic Games, in 2008. I took first place in 6 different events, and got to experience first-hand what Michael Phelps must feel like with all that gold hanging around my neck! 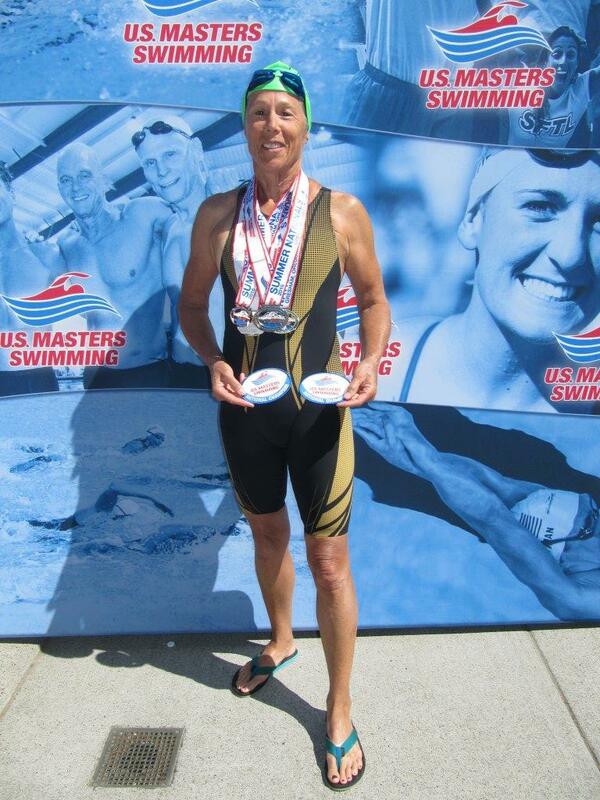 In 2010 my husband and I retired in Ashland, OR, and I joined the Rogue Valley Masters Swim Team (in choosing a town to retire, at the top of my priority list, it had to have an active Masters swim team!). So then I started competing in meets sanctioned by Oregon Masters Swimming, and I have met even more wonderful, friendly folks who like to swim. In addition to competing in various local and state meets, I also participated in the 2012 and 2016 Nationals at Mt. Hood Community College, again placing in the Top Ten in several of my events. I have 3 huge highlights so far in my competitive swimming career. They all occurred at the 2016 Nationals this past summer. 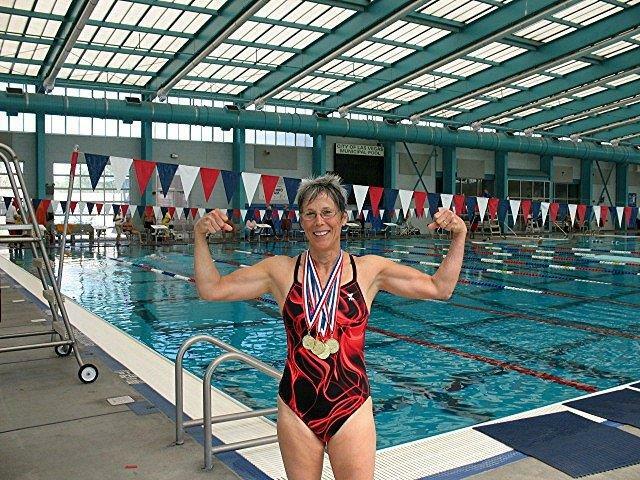 The first was setting a new National record in the Women’s 50M Freestyle (LCM), in my age group (70 – 74). I trained for four months with the coaching and encouragement of Dr. Mark Hageman (my present unofficial swim coach; and he is such a good coach he should seriously consider earning his coaching certification, hint, hint!) and my good friend and RVM teammate Matt Miller. I was able to grab that goal and hang on to it for only a few moments. I swam a :33.95 (the old record was :35.22). In the very next heat after mine, Diann Uustal set a new record of :33.52 (great swim Diann! ), so I literally held that record for just minutes. The second highlight of my swimming career was helping to set a new relay World Record: I was invited by David Radcliff (1956 Olympic swimmer) to swim a leg in the 200M Mixed Freestyle Relay, with him, Willard Lamb, and Barbara Frid making up the rest of the relay team. We won it in a time of 2:35.97, breaking the previous Japanese record of 2:37.10 (no picture!). 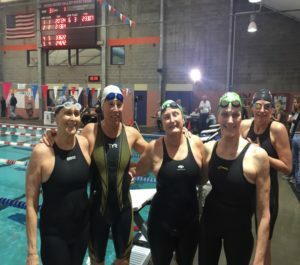 The third major highlight of my swimming career was another relay – the Women’s 200M Medley, made up of myself, Joy Ward, Sandi Rousseau, and Janet Gettling. We set a new national record in that event with a time of 2:53.85, the old record being 2:54.81. I am thrilled to have these wonderful experiences, and my husband still teases me about having to make the doorways in our home wider just so I can get my head through! In conclusion, in reflecting on my almost 40 years of swimming, I have to say it just keeps getting better and better as the decades go by! The physical and emotional benefits are priceless, I still love getting that wonderful endorphin rush after each workout, I love the camaraderie with fellow swimmers on deck and in the pool, and I still very much appreciate and value all the friendships made with coaches and swimmers through the years. Great article mom! You have told a very motivating, inspirational story. Nicely done.